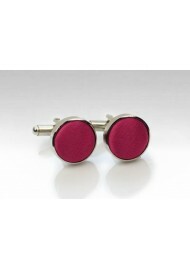 This classic burgundy red cufflink set is perfect for your formal wardrobe. The polished silver cufflink body adds elegance while the deep burgundy fabric covering adds just the right amount of color. These cufflinks look even better when paired with a compliment necktie or bow tie (see matching ties via link below).